The colours are just so pretty and include some brands I haven't tried before! 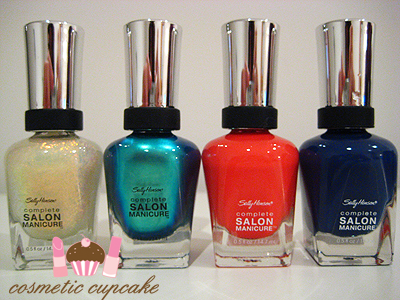 Sally Hansen Complete Manicure Hidden Treasure, Lagoon, Kook-A-Mango and Thinking of Blue. HIDDEN TREASURE!!! Need I say more? *dance* Lagoon is so so pretty, it reminds me of Gosh Ocean actually. I've very much wanted to try the Complete Manicure range however the prices down under are just ridiculous. Wet n Wild Lust, Saved By The Blue and Orly Lollipop. My 1st Wet n Wild polishes and an Orly polish crossed off my wishlist - thanks Jess! Jordana Mint Candy, Sinful Colors Mint Apple and China Glaze Metallic Muse. Some wonderful greens that I'm so excited to add to my collection! I've had Metallic Muse on my wishlist for aaaages now for konading so yay! As soon as my exam is over next week I am going to have to polish my nails daily or at least 2nd daily! I have so many gorgeous polishes to try it's not funny. Thank you for these wonderful polishes Jess! My Polished Pink for October giveaway ends in 3 days so don't forget to enter here. i am glad i was able to send you stuff you liked! you definitely did the same for me, and I have the day off so i will be working on my swap pics! i forgot to tell you, the jordana is supposed to be a "perfect" dupe for Chanel Jade! Asdhfdjhsgasfjl I am SO jealous that you got Hidden Treasure! Lots of great polishes in here; I really like the look of Mint Candy and Lagoon. I can't find Hidden Treasure anywhere here! Sooo Lucky! Ahah so that China Glaze Metallic Muse can be used to stamp. Wishlist! @Christina: It was a lovely swap. I just go gaga over flakies!! I still haven't tried out the ones you gave me yet. I want to use them but then I don't because they are so special! @Jess: I absolutely love the polishes Jess! I can't thank you enough =D Can't wait to see your pics using the Aussie polishes! Oh that's awesome about the Jordana! I thought it was a beautiful green and now it's even better hehe. @Danielle: Awww sorry to make you jealous hun! I still can't believe I have my own bottle =p I used Mint Candy in my latest mani and it's gorgeous! @JQ: I didn't have any chance of owning Hidden Treasure but thanks to lovely Jess I now have my own bottle. I am indeed VERY very lucky! The whole Khrome collection from China Glaze is great for konading so put them on your wishlist! @tasha~: It was awesome loot yep! @Nadine2point0: It's a gorgeous colour. Definitely get it if you can! @Katrina: They are loads of fun I agree! And I don't have to feel guilty for buying polish either hehe.